We’d love your help. Let us know what’s wrong with this preview of Dimestore by Lee Smith. For the inimitable Lee Smith, place is paramount. For forty-five years, her fiction has lived and breathed with the rhythms and people of the Appalachian South. But never before has she written her own story. Set deep in the mountains of Virginia, the Grundy of Lee Smith’s youth was a place of coal miners, tent revivals, mountain music, drive-in theaters, and her daddy’s d For the inimitable Lee Smith, place is paramount. For forty-five years, her fiction has lived and breathed with the rhythms and people of the Appalachian South. But never before has she written her own story. Set deep in the mountains of Virginia, the Grundy of Lee Smith’s youth was a place of coal miners, tent revivals, mountain music, drive-in theaters, and her daddy’s dimestore. It was in that dimestore--listening to customers and inventing adventures for the store’s dolls--that she became a storyteller. Even when she was sent off to college to earn some “culture,” she understood that perhaps the richest culture she might ever know was the one she was driving away from--and it’s a place that she never left behind. To ask other readers questions about Dimestore, please sign up. Growing up in Grundy, Virginia a coal town and spending much of her life in Chapel Hill, Lee Smith is Southern to the core. I am sure that those raised in the South will identify with much that I didn't, phrases, foods, manners and traditions. But, I loved this memoir, love this author and her books and you don't have to be Southern to mourn the changes in your home town, or in my case neighborhood, the stores that are gone, places that meant much in your youth no longer there. Family and the im Growing up in Grundy, Virginia a coal town and spending much of her life in Chapel Hill, Lee Smith is Southern to the core. I am sure that those raised in the South will identify with much that I didn't, phrases, foods, manners and traditions. But, I loved this memoir, love this author and her books and you don't have to be Southern to mourn the changes in your home town, or in my case neighborhood, the stores that are gone, places that meant much in your youth no longer there. Family and the importance of traditions no matter what they are. Mental illness and the effects of such on family as well as the people themselves. A Mother's grief, universal I believe. Divorce and dysfunctional families. Dimestores, her father owned the local Ben Franklin, we had Woolworths but much sounds the same. The places and ideas formed her writing and what writing means to her. New authors discovered, books added. A wonderful little amusing anecdote about Eudora Welty. So much in this little book. Was blown away by her honesty, her willingness to share so much with readers, told in an unsentimental voice in a series of essays. A nostalgic read whether Southern or not. My exposure to this particular part of Southwestern Virginia, where Lee Smith grew up, is limited mostly to the years my brother went to college close by, but I’ve been there before and since. I was there two years ago, and while some parts have changed significantly, others still sometimes have me feeling as though I’ve momentarily stepped into a time warp. This memoir gets its name from the five and dime her father owned, which later became a Ben Franklin store. Now, of course, the town has changed even more, but you’ll see it through her younger eyes, and if you grew up in an era like this, you might recognize your town in these pages, too. It offers a peek at Appalachian life in the 1950s to 1960s, but it’s more than that, and it tackles many topics, mental health, family, loss, tradition. There are stories. Stories about family. Stories about friends, about writing. Stories about “becoming a lady.” There’s one story that stood out for me, that I loved, about an experience she had hearing Eudora Welty that was priceless. So many stories, I felt at the end as though I’d been sitting on her front porch side by side in rocking chairs, listening to her weave her magic. Why 4.5 stars instead of five? I didn’t really enjoy the beginning of this book as much, but the rest more than made up for it. Once she started sharing her life stories, I was riveted. I have never read anything before by Lee Smith, but this book, due to its title, struck my interest, so now I will try her other books. The title “Dimestore” reminded me of the dime stores where I grew up in Paso Robles, CA. And the above quote made me think of how my own town had changed, and of how I hate those changes. The first change to Paso Robles that I remember was when I was in 8th grade. The high school burned down. The kids cheered, and perhaps I had as fwell. But it was a beautiful high school with its ivy covered bricks. The first year in high school was spent in temporary buildings while the new, ugly building was being built. Sure, the architecture was the same, but it no longer had the bricks and the beautiful ivy. Lee Smith went on and on about the changes in her home town. She had met an old friend who had made that quote above. And last spring when my husband and I went to Paso Robles, I felt that same thing, only I had left Paso, even though I had returned over the years, once to move back but I living in Creston, CA instead, 20 miles east of Paso. Paso changed more after my parents had passed away in the early 2000s. First, an earthquake destroyed the Park Pharmacy building, the Clock Tower Building, as it is called. The pharmacy was where my mother had once worked in order to feed us kids and way before that it was Wilson’s restaurant, then the Blue Moon, and just before the pharmacy it was Johnny’s bar. My younger sister Karen got us all a brick from the fallen building. My mom had died in November of 2003, and the earthquake had hit a month later. My brick holds the screen door open, unless the winds push it aside, slamming the door. At a much earlier date, the town had grown across the Salinas River. Farm land was taken away to build track homes. A new Wal-Mart came in across the bridge over the Salinas River, just as it had in Smith’s hometown. Pharmacies downtown closed, as had the dime stores and a hardwood sto4re. I loved the dime stores, especially, the one I had wrote about in another review, The Jew Store, a book written by a Jewish woman who had owned what people used to call, A Jew Store. It, too, was a Jew Store, but we never called it that. I hated all the changes. When I was a kid, I used to take a canteen filled with water and ride my bike across the river on Creston Road, the road heading out to the small town of Creston, population 200. I road until I was tired, just to have to turn around and ride back home. This year when we returned, my husband and I drove to Creston to see our old farmhouse that had first been bought by a couple that destroyed my herb garden. They also had put in small rooster houses, and we figured that they were raising roosters to fight. “Isn’t that illegal?” we asked each other. They had even remodeled the house. Gone were all my stenciling on the walls in every room, gone was the wainscoting in the livi9ng room. Gone was the porch my husband had built, where we had slept in the summer while listening to the rain or to the coyotes. I cried. This time there was no house. Grape vineyards had taken their place. At least that was better than all the roosters. Still, the vineyards are taking up all the water, and now they are having court battles. My husband and I had met at The Loading Chute in Creston. We even got our first dog there, so my husband used to tell people that he met his girls at The Loading Chute. We had met at a July 4th dance and picnic held there. Well, The Loading Chute had burned down, but at least, when we had moved, we had asked the owner for the tin Corona sign, and he had given it to us. The new Chute was too modern for us, and everyone we knew in town was gone, all new faces. The old brick library in downtown Paso is still there, but now it is a museum. I have never wanted to go inside. I can still see, in my mind’s eye, every room in that old library, and I know where all the books were located that I loved to read when I was young. I remember when I moved back to Paso I had found an oak card catalog that the library had owned. Maybe they were selling it. I bought it, but then because we began moving around, I gave it away. I could kick myself. Now, downtown has been gentrified. The bars are all gone, but most were an eyesore. There are many new restaurants, and I admit, I like those, but I miss what it was and always will. At least the Paso Robles Inn remains, as does the Hot Springs Building. I am not sure about others because my poor vision has prevented me from seeing everything clearly. When I was a kid my friend Mary and I went into the Mercantile. We were trying on men’s hats when the one of the male salesclerks came over to ask if he could be of help. I think he asked for our dad’s size, but we didn’t have it. He knew better than to believe us, but he didn’t chase us out of the store. The Mercantile is now gone. I believe they may have saved the coin chute that the store had, where they would put your money and receipt into a container and it would go through a tube and be wisked upstairs to the cashier. And gone was the old newsstand and the soda fountain next door, which my sister reminded me was actually a liquor store. I used to buy Little Lulu and Archie comic books at the newsstand before I discovered real reading. And when in high school my friend Mary and I stopped by the soda fountain on the way home from school. I remember the old man in the park, the groundskeeper. He showed me the name tags on the trees and then showed me a pond near Spring Street. It was hidden I the trees, and I had never seen it before. He showed me the mosquito fish that were in it, and allowed me to take some home for my own aquarium. He also showed me how you can get pine nuts from pine cones. He should have been a teacher. And then Lee talked about her mom’s cooking, naming her recipes but not giving out recipes. I can’t say much about my mom’s cooking, as I didn’t like it, but her potato salad was out of this world, and while we all have her recipe, it has never tasted the same, probably because she used Miracle Whip and I use mayonnaise, plus the ingredients are guessed at just as she had done. I added it to my review of Pulling Your Own Strings on here. Next, Lee began talking about her dad’s depression, which in turn caused her mom to be depressed and anxious. I began to feel that this book was not much of a happy childhood memory book, or at least not the kind I wanted to read. I never talk about my dad in my reviews, of the divorce. It was not pleasant, and I had heard the stories all my life as my mother never could get over her years with him. I was blessed with having a great second husband, as was she. I will not make my mother’s mistakes of repeating. I was just glad that she left him when I was 8 years old. Lee’s later chapters were much more interesting to me. She gave lists of her favorite childhood and adult books, and I was able to download some of them onto my kindle. She talked about some famous writers that she had known, and I especially liked the writer Lou V. Crabtree, but you can only buy her books on hardcover or paperback. I felt sad about her own son’s mental illness and his death, and then the death of her second husband. But I had fallen to sleep while listening to this chapter, and when I awoke, I didn’t wish to go back and listen to all the sadness. I certainly wasn’t born into that world. Just a few miles from my birth place in the middle of the country the elevation is only 230 feet above sea level. The landscape is so flat that the most useless thing in the world is a vehicle’s emergency brake. It serves no purpose. In the beginning essays I was quite envious of her childhood. She was an only child for one thing. I was an only child, too -- for eighteen months. Then my sister took over and we were followed by two more sisters and five brothers. Being the oldest child of a large family and growing up on a farm, and not in town the way Smith did, I did not experience anything near the seemingly carefree childhood that she describes in her book. Furthermore, her family was the most prominent in the small, isolated coal town of Grundy. Her father owned the dimestore that serves as the title of the book. Her grandfather was the county treasurer and an uncle was Superintendent of Schools. Furthermore, her relatives owned and/or operated the Rexall drugstore, the movie theater, the Ford Agency, an insurance agency, and a lumber yard. What could be left in a community of a couple of thousand people? The early essays had so many saccharine elements that I felt myself experiencing a sugar high, which is ironic since I ordinarily suffer from the opposite condition. I wasn’t finding the story of this modern day Tom Sawyer all that interesting and I continued to read only because a couple of GR friends had been glowing in their praise of the book. After reading this I was a little more than ashamed of myself. I had been envious of her and now I was thankful that I had lived a different kind of life. It isn’t the first time that I have been forced to count my blessings. There is much to like in these essays. In this her first foray into nonfiction, Smith applies her talents as a novelist to describe what it was like to grow up in a southern Appalachian coal town and the changes that the area has undergone during her lifetime. I haven’t read any of her fiction, but I plan to rectify that soon. Thanks Diane and Julia for guiding me to this book. It's always a joy to get a glimpse inside a favorite author's life and thoughts. Lee Smith has been a writer that I follow, reading and loving her fiction for many years. This small book of essays takes us to Grundy, VA, a small coal mining mountain town, where Lee was a much loved only child, running wild with friends and cousins, surrounded by relatives and a community who took care of one another. Of course, she also received "lady lessons" from an Aunt. "The South runs on denial. We learn de It's always a joy to get a glimpse inside a favorite author's life and thoughts. Lee Smith has been a writer that I follow, reading and loving her fiction for many years. This small book of essays takes us to Grundy, VA, a small coal mining mountain town, where Lee was a much loved only child, running wild with friends and cousins, surrounded by relatives and a community who took care of one another. Of course, she also received "lady lessons" from an Aunt. "The South runs on denial. We learn denial in the cradle and carry it to the grave. It is absolutely essential to being a lady, for instance. My Aunt Gay Gay's two specialties were Rising To The Occasion and Rising Above It." A wonderful childhood, so it would seem. Yet we learn that both parents suffered from debilitating depression and mental illness, spending prolonged periods in the hospital. There's also a later chapter about her son's battle with a form of schizophrenia. She loses him when he is 33, and is brutally honest about her rage and grief. She is handed a prescription pad by her doctor: "Write 2 hours every day." She had been writing since the age of 9, her writing had gotten her through many hard periods in her life, had enabled her to support herself and her two children after her divorce, and now it helped her manage her grief. She lets us in on her writing habits, the hows and whys and wheres and whens. Her life in Chapel Hill and Hillsborough with her second husband, her teaching career, her favorite books, all the minutiae that fans love to know. She writes of her life with humor and common sense. Here's a sample: "I'm seventy, an age that has brought no wisdom. When I was young, I always thought the geezers knew some things I didn't; the sad little secret is, we don't. I don't understand anything anymore, though I'm still in there, still trying like crazy." The Autobiography of Lee Smith, author of Fair and Tender Ladies, On Agate Hill, and The Last Girls, is so beautifully written and heartfelt that you feel she is a neighbor or a friend, or at the least a person you would feel comfortable sharing a coke and hotdog with. Born in 1944 in Grundy, Virginia, Lee infuses her writing with a sense of place and persons who have all but vanished from the face of the earth. This is Appalachia at its core, coal-mining country, where family live across the str The Autobiography of Lee Smith, author of Fair and Tender Ladies, On Agate Hill, and The Last Girls, is so beautifully written and heartfelt that you feel she is a neighbor or a friend, or at the least a person you would feel comfortable sharing a coke and hotdog with. Born in 1944 in Grundy, Virginia, Lee infuses her writing with a sense of place and persons who have all but vanished from the face of the earth. This is Appalachia at its core, coal-mining country, where family live across the street and over the holler and the other side of the mountain, and you cannot go anywhere without being recognized and cared for. I particularly enjoyed this part of these essays, but it was also interesting to see how she took this beginning and lived a full life in other places and environments without losing this sense of who she was. Having always been interested in how others write, and why, it was enlightening to hear her stories of how she progressed from scribbling bits of imaginings to tapping into the depths of her soul for characters that resonated, like Fair and Tender Ladies’ Ivy Rowe. 4.5 stars. This is a wonderful collection of autobiographical essays by the queen of Appalachian fiction, Lee Smith. If you want to experience the soul of the region, and of Smith’s life, consider this book. Smith grew up in the coal mining town of Grundy located in southwest Virginia near the Kentucky border, the only child of older parents (her father owned the town’s Ben Franklin dimestore and her mother was a former teacher) who were both “kindly nervous,” each being hospitalized for severe 4.5 stars. This is a wonderful collection of autobiographical essays by the queen of Appalachian fiction, Lee Smith. If you want to experience the soul of the region, and of Smith’s life, consider this book. Smith grew up in the coal mining town of Grundy located in southwest Virginia near the Kentucky border, the only child of older parents (her father owned the town’s Ben Franklin dimestore and her mother was a former teacher) who were both “kindly nervous,” each being hospitalized for severe depression multiple times throughout her childhood. But Smith read voraciously and wrote, selling her handwritten “newspaper” at age nine for a nickel a piece, and she played outside until dark every day with all the other neighborhood kids. She rode a handmade raft with fifteen other college classmates 950 miles down the Ohio and Mississippi Rivers from Kentucky to New Orleans. She was a newspaper reporter in Tuscaloosa, Alabama. She was divorced by her first husband and father of her two children, but later found happiness with journalist and essayist Hal Crowther. She lost a son to schizophrenia/bipolar disorder. She is a lifelong fan of the “National Enquirer,” and her favorite childhood literary characters were saints and horses. A full, heartbreaking and interesting life. Honest, sincere collection of essays is a wonderful read. 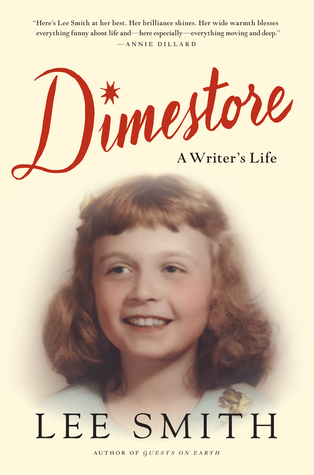 I quite enjoyed reading Lee Smith’s autobiographical essays in Dimestore: A Writer’s Life. She offers a close-up and very personal look at App LYRICAL. AN ENTERTAINING READ. I quite enjoyed reading Lee Smith’s autobiographical essays in Dimestore: A Writer’s Life. She offers a close-up and very personal look at Appalachian life in the 1950s/60s. My personal experience in Appalachia, in the coal mining hills of Southeast Kentucky, was all too brief—for only the first eight months of 1957—but left lasting and loving impressions of the place, of the people, of the culture, and of the hardscrabble life. Lee Smith’s essays bring back precious memories. “I’m seventy, an age that has brought no wisdom. When I was young, I always thought the geezers knew some things I didn’t; the sad little secret is, we don’t.” (Kindle Locations 1995-1996). Dimestore: A Writer's Life by Lee Smith, author of Oral History, Fair and Tender Ladies, and On Agate Hill s a beautiful memoir consisting of essays on aspects of her life. Lee paints a warm and nostalgic portrait of growing up in a loving, supportive, yet dysfunctional family in Gundy, Virginia. Her father ran the dimestore in town. A later visit to the city reveals the changes that occurred over the years. Grundy, on the flood plain, had been literally moved to high ground. Wal-Mart was invite Dimestore: A Writer's Life by Lee Smith, author of Oral History, Fair and Tender Ladies, and On Agate Hill s a beautiful memoir consisting of essays on aspects of her life. Lee paints a warm and nostalgic portrait of growing up in a loving, supportive, yet dysfunctional family in Gundy, Virginia. Her father ran the dimestore in town. A later visit to the city reveals the changes that occurred over the years. Grundy, on the flood plain, had been literally moved to high ground. Wal-Mart was invited in, and was followed by other chains. Her beloved mountain where she ran wild as a girl had been top-mined, now a naked mesa with a city park. I was especially moved when she wrote about her son, a brilliant musician who developed a mental disorder that required medication to keep him stabilized for a diminished life, but still one that mattered. Lee writes about books and reading, writing and teaching, love and the end of love. It was a lovely read. I read it each night before bed, drawing out my pleasure. This is divided into more than a dozen essay chapters of strongly memoir based topics. It's a fast read and gives a delectable and specific feel and locale identity to her Grundy. The small mountain town in Western Virginia that was her father's home place and her first place. Some of the chapters I liked and enjoyed much more than others. Absolutely loved the one in which she highlights her Mother's recipe box. And the Miss Daisy one was great too. It would have been four stars for me except for This is divided into more than a dozen essay chapters of strongly memoir based topics. It would have been four stars for me except for the continuity (gaps and lacks galore) and for the writer writing about "the writing". Just one of those least favorite topics for me. But I did like the ending and the honesty for her family's experiences with mental illnesses. Especially her frenetic state after his death. That's not unusual and it is profoundly difficult. Lee Smith mentored me when I was first learning how to write fiction. With DIMESTORE she is mentoring me still, showing me how to live as a writer. Smith recognizes story when she hears it, be it in an MFA program or coming from a woman wearing a man's hat and dropping papers and pens all over the place when she enters class late. Once I'd successfully written a novel, I became in the public's eye, a writer. It can actually be a heavy mantle to carry, and difficult to navigate. With wit and char Lee Smith mentored me when I was first learning how to write fiction. With DIMESTORE she is mentoring me still, showing me how to live as a writer. Smith recognizes story when she hears it, be it in an MFA program or coming from a woman wearing a man's hat and dropping papers and pens all over the place when she enters class late. Once I'd successfully written a novel, I became in the public's eye, a writer. It can actually be a heavy mantle to carry, and difficult to navigate. With wit and charm and the hugest heart of anyone I know, Smith not only navigates it but shows us how it's done. The cadence of the heart is pure poetry when Southern writers such as Rick Bragg and Lee Smith write of home. Lee Smith tells her story, her life story, her writing story, in the beautifully written collection of essays, Dimestore: A Writer's Life. Born in a town surrounded by mountains in southwest Virginia, Grundy, Lee Smith celebrates the town where her father owned the dimestore, and her mother raised her to leave. While her mother, who was "not from around here", no matter how long she lived The cadence of the heart is pure poetry when Southern writers such as Rick Bragg and Lee Smith write of home. Lee Smith tells her story, her life story, her writing story, in the beautifully written collection of essays, Dimestore: A Writer's Life. Born in a town surrounded by mountains in southwest Virginia, Grundy, Lee Smith celebrates the town where her father owned the dimestore, and her mother raised her to leave. While her mother, who was "not from around here", no matter how long she lived there, tried to raise her to be a lady, teaching her proper manners and sending her to relatives in the summer, Smith grew up with a love of mountain music, Appalachian culture, and the town and people who raised her. And, why not? While her parents both suffered from occasional bouts of depression and mental illness, relatives would take her in. And, in the South, it was just accepted that family members would go away for a spell to get better, and someone would handle the dimestore or take care of the child while they were away. Smith talks about always wanting to be a writer, finding her voice. And, she talks about all the experiences that made her the writer she is today, from living with her parents' illnesses, to dealing with her own son's schizophrenia, and the aftermath of his death. As tragic as those may seem, she also celebrates light and life, nature, and writing, the authors she met and loved, and reading and writing books. For the reader, there is poetry in Smith's writing. My favorite passage is the opening of "Lightning Storm". "When I was a child, books brought my deepest pleasure, my greatest excitement. Reading, I often felt exactly the way I felt during summer thunderstorms: I just had to run out of the house and up the mountain into the very storm to whirl in the thunder and rain on the rocky top while lightning cracked all around me." Ahhh. But, I also loved what she had to say about community in the short section about Thanksgiving and baseball games. And, what reader can resist an essay called "A Life in Books"? Dimestore, Lee’s book recommended by a friend with the advance reading copy furnished by Net Galley, begins, “I was born in a rugged ring of mountains in southwest Virginia – mountains so high, so straight up and down, that the sun didn’t hit our yard until about eleven o’clock.” The language of the first chapter had me tripping merrily with her back in time with rural places and people. I settled in for a cheerful return to the stories told on porches on long summer afternoons. My first impression lasted through her eavesdropping on adult conversations sprinkled with, “never been quite right,” “bless her heart,” or “kindly nervous” – a euphemism for mental illness. I’d heard them all in my own eavesdropping years. I knew the dimestores like her father’s where these conversations might take place. The cheer never quite leaves but becomes mingled with other emotions as she describes her father’s bouts with depression, her mother’s “kindly nervous” episodes, and being taken in and cared for by other relatives when both parents’ problems occurred simultaneously. My best advice? Don’t delay. Rush right out to reserve a copy at your local independent book store or click your account to have it delivered to your reading device when it goes on sale March 22. As all of my book borrowing friends will readily attest I’m an unrepentant page crimper - I simply fold over the top corner of a page that holds something I want to reread. Needless to say my copy of Dimestore by Lee Smith is probably the most page crimped book to be found. It is a treasure filled with warmth, honesty, understanding and humor. In this her first work of nonfiction Smith tells us of growing up in the small coal-mining town of Grundy, Virginia. It was a place where everyone knew everyone, and immediately helped a neighbor if assistance was needed. Her father owned the Ben Franklin dime store where he knew all the customers by name and sported a red bow tie at Christmas. Smith loved to help out at the store where the fluffed the dolls’ skirts and combed their hair as she made up stories about them filled with thoughts about where they came from and where they would go once they left the dime store. She grew up shadowed by mountains that she was free to explore and were so high that the sun didn’t hit her yard until almost noon. Her mother was a “real lady” who tried to show Smith a way of life other than the rural community in which she lived. She was sent off to get some culture - to Hollins College. Her dream had always been to be a writer, but when her professors told her to write about what she knew she swore she’d never write about Grundy. Thank goodness she did! She wrote beautifully about the Appalachian culture that she has come to appreciate, thus showing us people and a way of life that most of us never knew. Smith does not disguise the mental illness that was part of her family’s history and took her son’s life. Both of her parents suffered from a condition that was then called “kindly nervous” and often required hospitalization. She introduces us to relatives and local characters who changed her life, all described with love, respect and humor. Lee Smith's memoir DIMESTORE is a delight that anyone would enjoy. I've had the pleasure of knowing Lee as a friend and a role model for many years, and I knew quite a bit about her childhood and life and had heard some of these stories before, but the telling here is so much more complete and detailed, still in that wonderful Lee voice that I can hear in my head whenever I read her work. I loved the sections about growing up in the coal town of Grundy, VA the best; they brought a flood of nostal Lee Smith's memoir DIMESTORE is a delight that anyone would enjoy. I've had the pleasure of knowing Lee as a friend and a role model for many years, and I knew quite a bit about her childhood and life and had heard some of these stories before, but the telling here is so much more complete and detailed, still in that wonderful Lee voice that I can hear in my head whenever I read her work. I loved the sections about growing up in the coal town of Grundy, VA the best; they brought a flood of nostalgia and memories galore. But I also appreciated so much the chapters that dealt with the very difficult, painful history that Lee and her family endured with mental health issues. I had no idea that both her parents struggled with depression that required hospitalization. I knew a little about the worst imaginable tragedy that come into Lee's life--the loss of her son--but had no idea how the whole long, sad story played out, and how bravely she had fought through that experience to a place of such peace and strength. I feel that I was deceived and lead to this book under false pretenses. Lured by reviews that said this book was about her childhood and her father's dimestore...NOT. I can count on probably one hand the teeny tidbits about the store. Is this book a case of a published author capitalizing on her publishability? I tend to think so. These chapters are, unless I miss my guess, a re-packaging of essays, excerpts, and columns this author has written on a variety of very loosely related topics. Don't bo I feel that I was deceived and lead to this book under false pretenses. Lured by reviews that said this book was about her childhood and her father's dimestore...NOT. I can count on probably one hand the teeny tidbits about the store. Oh my gosh! How could I have missed Lee Smith all my life so far? First, there are tons of recommendations for southern reading in here. My Amazon cart is now full. Second, this woman is witty, charming and wise. I wish I could sit on her porch with her. The way she describes the life of a writer is essentially that we are all writers. She gives so many examples of her adult students’ writing that is simple, sweet and plain all at the same time being profound and almost ethereal. I was tempted t Oh my gosh! How could I have missed Lee Smith all my life so far? Second, this woman is witty, charming and wise. I wish I could sit on her porch with her. The way she describes the life of a writer is essentially that we are all writers. She gives so many examples of her adult students’ writing that is simple, sweet and plain all at the same time being profound and almost ethereal. I was tempted to put a bunch of quotes in here but realize that it will actually flatten the experience of reading this book and I want everyone to read it. Third, Lee Smith has reminded me why it’s perfectly okay to just be uniquely and unapologetically Belle. I’m good enough. It’s good enough. This book was an awesome experience. Please read. I loved this book in so many ways and for so many reasons. I've read nearly everything Lee Smith has ever written and I love her writing. This collection of essays about her life and her writing are just as beautifully written as any of her novels and short stories. Lee Smith was born and raised in Grundy, Virginia, a small town in southwest Virginia up in the Appalachian mountains. So many of the details of her childhood are so familiar to me because they mirror so many of my own. She attended H I loved this book in so many ways and for so many reasons. I've read nearly everything Lee Smith has ever written and I love her writing. This collection of essays about her life and her writing are just as beautifully written as any of her novels and short stories. Lee Smith was born and raised in Grundy, Virginia, a small town in southwest Virginia up in the Appalachian mountains. So many of the details of her childhood are so familiar to me because they mirror so many of my own. She attended Hollins College in Roanoke and her book "The Last Girls" paints such a vivid portrait of those years in the 1960s. In fact, the "back story" of how some of her books came into being enhance even more how much I appreciate them. Okay, I'll admit it. An autobiography gets an automatic ten points from me just because. However, this one earned it. I had a quiet appreciation as Lee Smith spoke in that honest, mature voice that expresses real life in a way that says, "This is it; live; don't waste it..." At least, that's what I heard. Writing was integral from the beginning. Her path of self-discovery included childhood reading and stories, and later, college; but it was teaching and witnessing the passionate, unorthodox writ Okay, I'll admit it. An autobiography gets an automatic ten points from me just because. However, this one earned it. I had a quiet appreciation as Lee Smith spoke in that honest, mature voice that expresses real life in a way that says, "This is it; live; don't waste it..." At least, that's what I heard. Writing was integral from the beginning. Her path of self-discovery included childhood reading and stories, and later, college; but it was teaching and witnessing the passionate, unorthodox writing of her students that seemed to add even more depth to her own journey and success. All of this was intertwined with her fascinating and detailed Appalachian upbringing that had some happy times and some sad times (didn't we all), and an adulthood that can be described the same. By the way, her parents were pretty, dysfunctionally, cool. This memoir in the form of short stories gives the reader a glimpse of author Lee Smith’s life from growing up in the small town of Grundy, Virginia set deep in the Appalachian Mountains, through her adult life mostly spent in and around the college town of Chapel Hill, North Carolina. If you are interested in knowing more about the author Lee Smith, I recommend this book; if you are interested in knowing more about the writing life, I recommend this book; if you are interested in beautiful, lyrical, entertaining stories, I recommend this book.